Bplus shows us their upcoming WiiWare title in action! 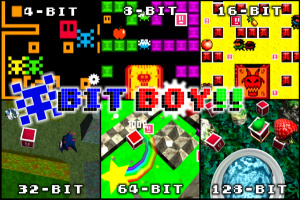 The guys at Bplus were kind enough to send us over their first official game play trailer for their upcoming WiiWare title Bit Boy!!. As you can see, the game will take the little hero Kubi through the various generations of video gaming. He, along with his surroundings, will change according to which particular generation of gaming he's currently in. Bplus has even included a little piece of artwork to illustrate the way certain objects change during their evolution through the various generations. You can take a look at the official press release and game play trailer below for more insight into the actual game and what you can expect from it. Bplus, independent software developer and creator of Niki – Rock 'n' Ball, PLÄTTCHEN – twist 'n' paint and Vektor Tank, today officially reveals the very first trailer video of the upcoming WiiWare™ retrorama Bit Boy!! Bit Boy! !, is a totally new kind of game mix in which one-pixel-hero Kubi rushes through the whole history of videogames in order to save his pixel pals. "Everyone knows that Bplus really is a crazy company. We lifted up a gearwheel to the top of evolution and let it fight against evil Plättchen 6 billion years in the future. We transformed a boy into a ball, only to let him become a rock to stand up against metal crabs and flying trees. With Bit Boy! !, we created a fantastic new arcade adventure that is delivered together with all its never-before-seen prequels from the different videogame eras. From ages 14 to 40, each Bit Generation will spark true retro feelings in all players when they set off in the ultimate pursuit of fruits and highscores." Players can grab a pal for even more fun in the cooperative mode. The Wii Remote is your joystick – the arcade adventure begins. 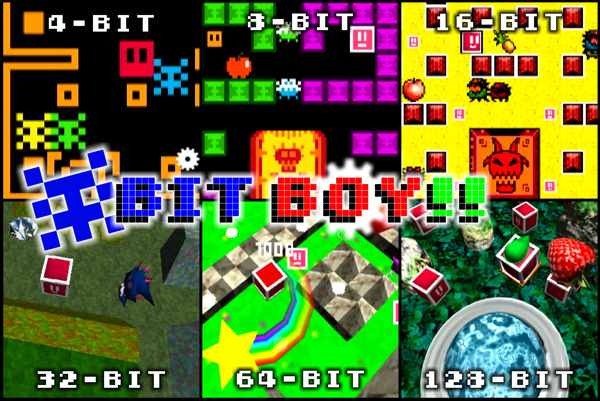 We'll have more information on Bit Boy!! as it becomes available, as well as a full interview with Bplus regarding this unique new WiiWare title. Looks pretty cool, I'll keep my eye on this one. Looks pretty cool. Can't wait to find out more. Maybe our interview will reveal more information about the game. Very interesting. I guess it's done if it has an ESRB rating, which is odd, as until now it sounded like it was fairly early along in development. Oh well, whatever. On the radar for shizzle. The 4-bit thing really irritates the computer pedant in me because it makes no sense, but the game looks pretty groovy. It looks good, but I'm worried about the gameplay, it seemed that all the eras were played in almost the same way, didn't expect that, mmm I still hope this turns out right. This game actualy looks fun. Hmmm, the game actually looks worse now that I've seen the trailer. Although I haven't obviously seen much of it, the gameplay looks drastically less appealing than what I was hoping for. Mainly, I was hoping for something a little more free, and mazes, well, they're kind of the opposite of free. The graphics aren't that impressive either, and I mean that for each platform. The idea is interesting, and I'm still intrigued, but right now, I'm not getting my hopes up. This seems like a clever idea uniquely executed. A definite download, I'm thinking. What do you mean about them not making sense? I'm not questioning your conclusion, I'm just too dumb to know what you're referring to specifically. I dunno...C'mon BPlus! Surprise me! It looks nice, but I hope this does not get poor reviews like other ones. Yeah, this could be Bplus best work. That might not be saying much, but hopefully it is a better effort. Certainly looks like a great idea if they can pull it off. @ChickieBrutie: Well, the game claims to be a tour of video games past. Back when the Atari 2600 and it's competitors ruled the roost (what the first stage seems to be emulating) the consoles used 8-bit processors, meaning the CPUs could process 8-bits of data at a time. They seem to be trying to distinguish between these systems and the NES/SMS because for most gamers it's hard to imagine that the NES/SMS were also 8-bit systems, it's just that their CPUs had higher clock speeds (meaning they could process more chunks of data in the same timeframe) and more memory. I won't claim to know the CPUs in all of them but their may have been other differences as well such as co-processors for graphics on the later 8-bit systems. But, like I said, I'm just being pedantic! I already have the audio extracted, converted and put on my SD card. It's fun to listen to the trailer audio as you fall asleep. I'm glad that everyone is finally seeing some good in Bplus' work, and I hope that it can live up to this small-scale-hype I've been looking forward to this since I got myself some details on it a couple of weeks ago, and the trailer only makes it seem better as well. Hopefully, Chicken Brutus is right though, and we won't have to wait long to give it a go. @Metakirbyknight: Agreed - the music is really catchy, and I love it. If you're interested, "Kubi's Song" is available as part of the Bplus Soundtrack part 4 on the Bplus forums, and I love it. Yes, it's a wonderful parody of how a franchise plays exactly the same despite the different (and dubious representation of some) generations. No! I'ts Bplus and man does that game look repetitive and ugly as hell.- the 8-bit and 16-bit sections are about as good as it gets. The 64-bit and 128-bit visuals are plain laughable but I expected nothing less. @Calculon: GIVE THE GAME A CHANCE. I'm with you, Virus. Was intrigued by the premise, thought it was going to be more like Retro Game Challenge, with different types of gameplay... but it's just one maze after another, with updated textures and graphics along the way? Hmm. I'll stick with the Bit.Trip games to quench my need for games with Bit in the title. This is Bplus we're talking about. I'm staying far away... This is probably trying to grab some cash by putting "Bit" in the name. This ain't gonna work unless they add different types of gameplay. Emulating times that pretty much feel the same but with slowdown and other problems? It seems to retain the B+ way, sadly. @Wiiloveit. Calculon? Give a Wiiware game a chance? That's crazy talk! This one's goin' on my radar. This just might be the first B+ game worth playing.